Turck’s Tarantula. Photo courtesy of Fly of the Month Club. Answer: Over the past two weeks, we took on the streamer and nymph portions of this question, so now it’s time to turn to dry flies, which should include a lot more variation. But once again, I will reveal myself to be relatively unimaginative, as I almost always choose a Parachute Adams to start. I used to be a Royal Wulff kinda guy, but many fall days on Maine’s Rapid River casting for landlocks proved to me the superiority of the PA.
Well, first up, I suppose we’d need to define what a “searching pattern” actually is. I’m working on the assumption that for most of us a searching pattern is the fly that we believe is most likely to be eaten when nothing specific appears to be happening on the water. Covering the bases is the name of the game, so the fly should then be a general attractor—the one that we think looks like just about everything that a fish might eat, but nothing specific enough to be passed up as not being on the menu. I’d then give a little thought to the time of year and what should be happening on the water. During the height of summer a big bouncy terrestrial might be a fair bet, whereas spring and autumn (Fall to you northerners) might call for a more delicate generic mayfly pattern or emerger. The last piece of intel required before I’d make my selection would be past experience and a bit of local knowledge: what has worked for me before or what is likely to work given what I know about this particular fishery. Given all this, the fly that you come up with should probably be the fly that you should fish most of the time anyhow! That’s if, like me, you don’t put a lot of credence in specific fly patterns anyway. For summer dry/general terrestrial fishing, Bob Wyatt’s no-hackle Deer Hair Sedge(DHS). Basically a Hare’s Ear Nymph held aloft by a nice tuft of deer hair, it’s super floaty and almost indestructible. The “no-hackle” is very important because it lets the abdomen sit flush in the surface film, presenting a really nice prey image. In spring and autumn, I’d likely go for a Snowshoe Emerger, a semi floating Hare’s Ear Nymph suspended under a shock of Snow Shoe rabbit fur (from the pad of the foot). Durable, supper buggy and highly visible. FC Crackleback. There isn’t a more versatile fly out there that can be fished as an attractor. Once it starts to drag, you can pull it under, swing it, skip, and then strip it back. It takes fish every way imaginable. Alternates: Tan Elk-Hair Caddis andParachute Adams. Partridge Caddis. This fly covers many caddisfly variations and can work as a “near-enough” mayfly in riffles. I have been known to twitch it underwater and strip it like a streamer/emerger. It is just edible. Parachute Adams. A great fly capable of matching several different types of insects, and it’s also easy on the eyes while fishing and an easy fly to tie when you need it. Dry used to be either Parachute Adams or Parachute Hare’s Ear, and I still use them a lot, but I think the Stimulator has edged itself into my top searching dry. Why? First, I find them more satisfying to tie and actually a little quicker. Even though a Stimmy has more parts, they always seem to go together better. Second, if you tie the wing properly—high and wide, as Randall Kaufmann suggests—the fly is more visible than the parachute flies, and the elk hair and palmered hackle keep the fly floating higher and longer. Third, the more I study trout, especially small-stream trout, and the importance of terrestrial insects, the more I lean toward bigger flies. Since trout seldom see one kind of terrestrial in any great numbers, combined with the fact that they are opportunistic feeders, given the opportunity they will take the largest fly they recognize as food. And although the Stimmy is a fine imitation of stoneflies and hoppers, it can also look like a big wasp or horsefly or beetle with its wings still outstretched. (Beetles fly into the water more often than they fall, and their wings are usually exposed.) And, finally, trout eat a lot of moths from very early in the season until early winter, and the Stimmy makes a wonderful moth imitation. Parachute Adams, size 16. This fly works like a charm for me! 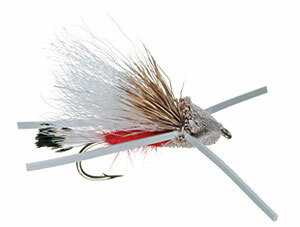 It doesn’t seem to matter what is hatching, but if you use this fly in an appropriate size, it will catch fish. I usually even simplify it to just a grizzly hackle (eliminating the brown) when tying it. Parachute Adams. The PA is a decent attractor pattern and a fairly good imitation for the blue-winged olive hatches, will sometimes suffice for a PMD, works during the caddisfly hatches, and in very small sizes can be fished as a Trico. I reserve the right to change sizes on this pattern, but if it’s one dry fly for the season, the Parachute Adams would be it. Turck’s Tarantula. I don’t even have to think about this one. This fly is such a scorching attractor, and can often convince even tailwater fish to come up and grab it. It is also a great fly when animated, and even a terrific streamer and diver. That it’s also buoyant enough to hold up all sorts of droppers is great, too. Black Humpy, size 16. When I was in my 20s, two friends and I bought abut 40 dozen of these when a fly-fishing business in San Francisco folded up. They were the “learning” efforts of the company’s going-nowhere fly-tying operation and were dirt cheap at the bankruptcy auction. Too dumb and poor to know better, we fished them almost exclusively for years in Northern California and did surprisingly well. Alternates: Royal Wulff, size 14. If this offends you, I’m shattered. Parachute Adams, size 16. Nothing surprising here, but they all pull up fish, and they’re all easy to see, something my aging eyes appreciate. My concept of a searching pattern is that it should resemble as many common food forms as possible—not an exact imitation of anything, but a pattern that suggests a wide range of natural foods. This is what makes it work in all seasons and at various times of day and in a variety of different waters. Still, picking a single favorite dry fly is difficult, as I spend a lot of time fishing spring creeks and tailwaters, and they demand a different searching pattern than a freestone stream. Over the course of my fishing career, an Al Troth-style Elk Hair Caddis has definitely caught me more fish than any other dry-fly pattern. The pattern is a good imitation of small stoneflies, as well as caddisflies, and it suggests a variety of terrestrials, as well. (In the last few seasons, I have been using a Rubber Leg Stimulator even more, for all of the same reasons.) On spring creeks and tailwaters, a Sparkle Dun is my choice. This pattern represents a variety of mayflies (and other surface food), and it has all of the features of a great all-around pattern—simple, durable, floats well, and it combines the effectiveness of an emerger with the visibility of a dun pattern. Large black foam beetle with rubber legs. This is a great indicator fly if I want to tie on a nymph below, and it has brought more big trout to the surface than any other dry fly that I’ve ever fished. PMX, size 10. This is a great attractor that can imitate caddisflies, Stoneflies, and terrestrials, and it just plain looks buggy floating down a bank or good riffle. It’s got all the hallmarks of a great attractor, from the parachute hackle to the rubber legs to the peacock hurl body, and it’s very buoyant if you want to drop your favorite searching nymph off the back. Brown Foam Flying Ant. Regardless where you are and what hatches are taking place, trout love ants to death! Parachute Adams, sizes 10 through 22. Effective anywhere in the world, buggy colors, and it can be taken as a dun or a spinner.